Michael Hadley | Division of Wildlife Resources Wayne Gustaveson, a Utah Division of Wildlife Resources fish biologist, displays a largemouth bass he caught at Lake Powell. Since 2012, the lake’s striped bass have been under a consumption advisory due to the presence of mercury found in fish south of Dangling Rope Marina. A new study by the U.S. Geological Survey has found the highest concentrations of the toxic metal are in the side canyons feeding into reservoir. Mercury has long plagued parts of southern Utah’s Lake Powell, cropping up in sport fish that have been the subject of consumption advisories since 2012. But the metal in its most toxic form is not evenly distributed around the 186-mile two-arm reservoir. Methylated mercury instead is concentrated in Lake Powell’s side canyons, where water tends to be more stagnant and contains less oxygen, according to a study released this week by the U.S. Geological Survey. Mercury, which gets into water naturally and from industrial sources, is a silvery metal — hazardous to humans, fish and wildlife. In low-oxygen aquatic conditions, such as those found in stagnant water laden with decomposing organic matter, microorganisms convert elemental mercury into its methyl form, making it possible for the mercury to concentrate into the tissues of aquatic plants and animals. Bird and fish species at the top of the food chain are more likely to show high concentrations of methylated mercury. The U.S. Environmental Protection Agency has determined more than 0.3 micrograms in game animals can be dangerous for humans to eat. Lake Powell is among 34 Utah bodies of water where consumption advisories are in place, mostly for predatory sport fish, such as brown trout, splake, bass and walleye. 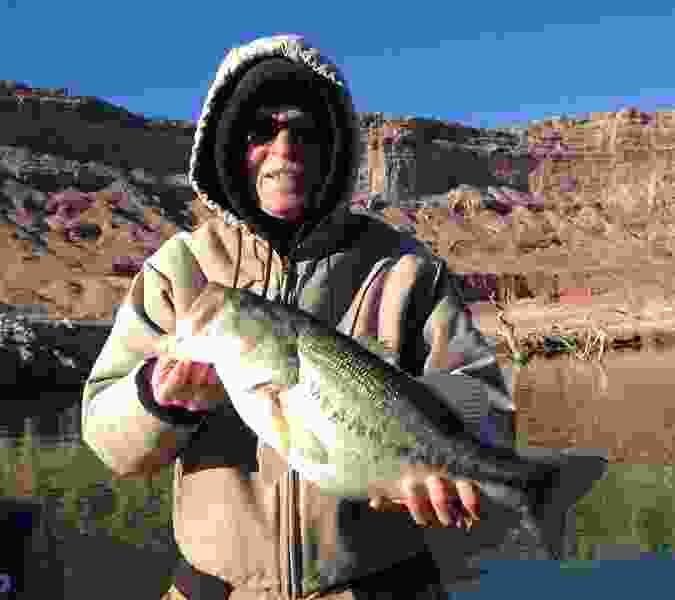 Fishing, especially in spring, is a main draw for Lake Powell, the centerpiece of Glen Canyon National Recreation Area. Visitation there topped 4.2 million last year, putting it on par with Utah’s Zion National Park as among the busiest destinations run by the National Park Service. The nation’s highest levels of methyl mercury are found in Utah’s Great Salt Lake, which is too saline to support fish. Utah has issued advisories for three species of duck hunted at that lake. In 2012, the Utah Department of Environmental Quality determined Lake Powell’s fish barely breached the mercury standard, at least for striped bass. “The bass, bluegill and walleye eat mostly shad. They are receiving the same food chain. They are going to have similar low levels of mercury [as stripers],” said biologist Wayne Gustaveson, who oversees the Utah Division of Wildlife Resources’ Lake Powell program. The initial advisory was based on 803 samples taken in 2012 and covered much of the lake. The advisory was adjusted two years later to cover just the southern reaches below Dangling Rope Marina. This change was made because up-lake fish did not show elevated levels of mercury, according to Gustaveson. But after learning about the new USGS findings, Gustaveson believes further study is in order. “We need to sample more fish in side canyons versus the main stem,” he said, adding that the lake’s fish are generally safe to eat. Utah’s differing advisories for the lower and upper reaches of the lake prompted the USGS to investigate the distribution dynamics of mercury in Lake Powell. For the study, agency scientists gathered water, sediment and plankton samples from 25 sites in the late spring of 2014 and again in late summer. They also sampled fish at three locations: Wahweap Bay at the lake’s lower end; Good Hope Bay far up the lake’s Colorado arm; and a spot up the San Juan arm. The findings did confirm the state’s conclusion that the lower lake had high levels of mercury, but there was also a surprise. The highest mercury concentrations were found in bass sampled in the San Juan arm, far above Dangling Rope. Powell’s narrow side canyons are where land managers may try to introduce oxygen into the water with the use of solar-powered pumps that circulate water from the lake bottom to the surface, creating a convection cell in the water column, Naftz said. Such techniques are in use at another southern Utah reservoir as a way to disrupt the methylation process.